Melina Pinales is a doctoral student at the School of Education with a concentration in Educational Policy and Social Context (EPSC). She was born and raised in San Antonio, Texas. She received her Bachelor of Science degree in Human Development and Family Sciences from the University of Texas at Austin in 2014. She is a Gates Millennium Scholar and has been awarded the prestigious Eugene-Cota Robles Fellowship in support of her doctoral studies. ​Melina’s research interests are geared towards understanding the developmental needs of ethnic minority children to address policy reform, specifically in early childhood education settings. Being the child of Mexican immigrants, her early cross-cultural experiences sparked her interest in understanding the developmental pathways of multicultural/multilingual students from diverse settings. 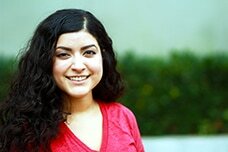 Under the advisement of Professor George Farkas, Melina is currently serving as the Lead Project Coordinator of a UCI Reading One-to-One tutoring program where undergraduate students provide 1-1 reading tutoring services to young elementary students in a school within the Santa Ana Unified School District.